Success in high performance sport is highly valued in today’s world, with lucrative contracts, sponsorship deals, and opportunities for celebrity status balanced against substantial investments of time and energy, and high chances of failure. With pressure mounting on athletes and coaches to make the most of athletic investments, the temptation to make health-related or ethical compromises is growing. 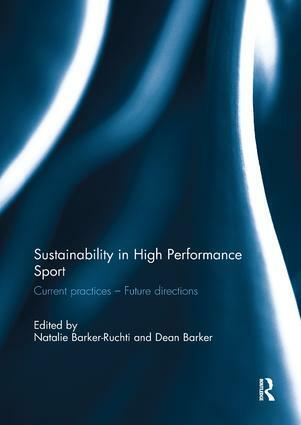 Sustainability in High Performance Sport examines the pressures faced by coaches and athletes, and considers how sustainable science can offer alternative pathways to sporting excellence. By applying principles relating to carrying capacities, complexity and uncertainty, production and consumption, and ethics, this unique book provides new ways of thinking about both enduring and emerging challenges. With a scope that includes themes such as coaching practices, coach-athlete relationships, over-training and injuries, the development of sporting expertise, and doping, Sustainability in High Performance Sport is the most comprehensive exploration of sustainability in elite sport available. It is an invaluable resource for anybody with an interest in achieving long-term success in high performance sport. This book was originally published as a special issue of Reflective Practice. Natalie Barker-Ruchti is Associate Professor in Sports Coaching at the Department of Food and Nutrition, and Sport Science at the University of Gothenburg, Sweden. Her research interests lie in understanding how sport coaches and coaching affect athlete learning, identity and wellbeing, in particular in high-performance settings. In these works, the development of sustainable sporting practices forms a key aim. She has published journals including Sports Coaching Review, The International Journal of the History of Sport, and Physical Education and Sport Pedagogy. She co-coordinates the Sport Coaching Education Program in her department and teaches on its sociological and pedagogical courses. Dean Barker is Associate Professor of Pedagogy and Physical Education in the Department of Food and Nutrition, and Sport Sciences at the University of Gothenburg, Sweden. As an educator, he coordinates a physical education teacher education program, works with aspiring sports coaches, and is involved in professional development programs for practicing physical educators. His research interests are informed by constructivist and socially critical perspectives, and have focused on issues related to pedagogy, knowledge development, and social interaction.